The Julbord buffet lies at the center of a classic Scandinavian holiday celebration. We invite everyone to celebrate and learn more about Swedish traditions over a delicious meal with family and friends. 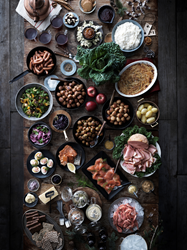 This holiday season, IKEA invites everyone to celebrate together at its annual Swedish Julbord on Friday, December 9, 2016 at participating stores nationwide**. In Sweden, a traditional Julbord celebration gathers family and friends to enjoy each other’s company during a lavish meal, created from both cultural and family traditions. IKEA is inviting everyone to join in on the fun with an all-you-can-eat buffet featuring traditional Swedish fare. Tickets are available for only $16.99 per person / $4.99 for kids 12 and under, or at a discounted rate for IKEA FAMILY members ($12.99 per person / $2.99 for kids 12 and under). Those not able to make it to the event can still experience the Swedish tradition at home. Visit the Swedish Food Market in IKEA U.S. stores to purchase select items from the Julbord menu, including KÖTTBULLAR Swedish meatballs, or to explore, find and try ingredients for other Swedish recipes, such as marzipan candy. **IKEA Carson will not host a Julbord Party in 2016. Since its 1943 founding in Sweden, IKEA has offered home furnishings of good design and function at low prices so the majority of people can afford them. There are currently more than 385 IKEA stores in 48 countries, including 42 in the U.S. IKEA incorporates sustainability into day-to-day business and supports initiatives that benefit children and the environment. For more information see IKEA-USA.com, @IKEAUSANews, @IKEAUSA or IKEAUSA on Facebook, YouTube, Instagram and Pinterest.